Stonehenge, is a prehistoric monument that took approximately 1,500 years to create. It is comprised of about 100 huge upright stones arranged in a circle. Most experts believe that Stonehenge was a burial site. But they have not yet discovered how the massive stone structures were built using the technology available at the time. The sandstone used in the outer ring were quarried locally, but the bluestones of the inner ring come from the Preseli Hills in Wales, about 200 miles away! Stonehenge is a UNESCO World Heritage Site. The earliest sections of Stonehenge were probably constructed more than 5,000 ago. The first stage was the construction of a massive circular ditch and bank – perhaps this was originally a Hill Fort or defended enclosure? It was hundreds of years later when approx 80 bluestones were transported from Wales (43 remain today) and used to construct the first ring of stones. A third phase of construction in 2000 B.C., created the outer ring of sandstone slabs made from locally quarried stone. 50 of these ‘sarsen’ stones are what you see today although there were originally many more. Stonehenge continued to evolve until roughly 1600 B.C., with the bluestones being frequently repositioned during this time. Stonehenge’s sarsens can weigh up to 40 tons and are up to 24 feet (7m) tall. They were quarried 25 miles north of Salisbury Plain and pulled using sledges and ropes to the site. Some of the stones might have been local to the site. However, the bluestones definately came from the Preseli Hills in Wales. It is probable that sledges and rollers made out of tree trunks were used to transport the bluestones from the Preseli Hills to the coast. They could then be transferred onto rafts and paddled up the River Avon. Some geologists believe the Blue Stones could have been deposited in Salisbury plain by glaciers. Who Built the structures at Stonehenge? For hundreds of years Stonehenge has been a magnet for modern Druids who believe that the site was originally constructed by Celtic Druids. Unforyunately for them, radiocarbon dating has shown that the Stonehenge precedes the Celts by at least 1000 years. Most historians and archaeologists now believe that several different tribes contributed to the phased construction of Stonehenge. Artifacts and bones found on site support this idea. Many modern scientists now think that native British people were the original builders with continental tribes such as Celts contributing to it’s development over the centuries. There is recent archaeological evidence to suggest that Stonehenge was used as a burial site, but that it served other functions as well. As a ceremonial site, religious center, a cemetery for royalty or a monument to remember their ancestors. The idea that Stonehenge could have been an astronomical site is less popular today. A more recent theory is that the blue stones at Stonehenge could have been attributed with healing powers since a number of human remains have revealed signs of illness and injury. Stonehenge is one of the most famous archaeological sites in the world attracting more than 800,000 tourists every year. 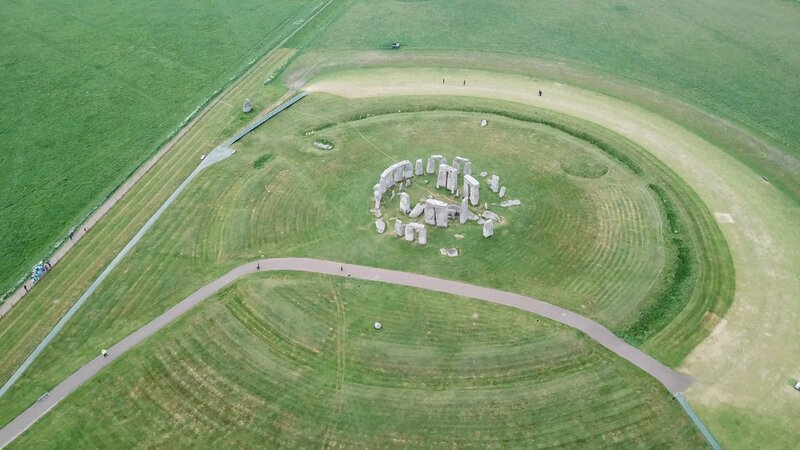 In 1986 Stonehenge was awarded UNESCO World Heritage status along with Avebury, the Neolithic stone circle 17 miles away. Archaeological excavations have revealed several other important sites nearby, including other henges.